English Trifle at Cuthbert's Tea Shoppe. Photo: Elizabeth Urbach. 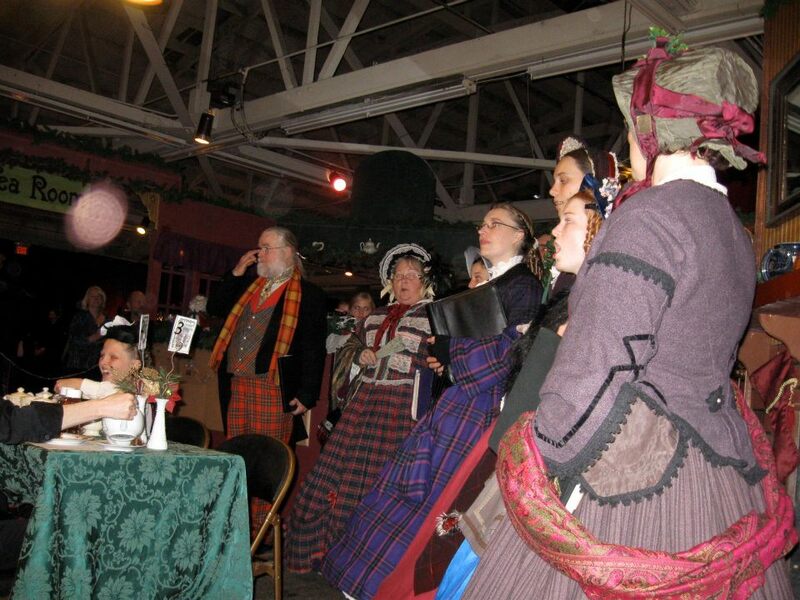 Hurry and get your tickets to the Dickens Fair, because December 17 and 18 is the last weekend! New for 2011, afternoon tea at Cuthbert’s Tea Shoppe has a new format. Instead of ordering your full tea off the menu when you arrive, as in the past, Afternoon Tea or High Tea at Cuthbert’s is now completely prix-fixe, down to the kind of tea you are served, and they are now only served at certain times of day, with a la carte items available in between. Reservations are still highly recommended! High Tea, served late in the afternoon, begins with a small pot of English Breakfast tea on the table waiting for you when you sit down. Shortly after that, the servers bring each person two 2-inch scones with a small amount of lemon curd, strawberry jam, and whipped cream in individual mini paper cups. Then, a plate of tea sandwiches with a variety of fillings (4 small sandwiches for each person), and lastly, a small plastic goblet full of English trifle, made with pound cake, strawberries, vanilla pudding and whipped cream. Cuthbert's Tea Shoppe commemorative teapot. Photo: Virginia Urbach. I was pleased to discover, when I was at Cuthbert’s for the 2011 season, that even though the staff were serving close to 100 people at one time, the scones were still warm when they reached our table! They were your standard cream scone, crumbly and slightly sweet, but very nice. The sandwiches included one or two of each kind of tea sandwich on the main menu, and for my party of two, we had four cucumber and cream cheese sandwiches, two smoked salmon, and two egg mayo (egg salad) sandwiches. Each of these sandwiches was the more usual ¼ of a whole sandwich, instead of the half sandwiches formerly served at Cuthbert’s; it was nice to have a variety of fillings this time, though. The English trifle was tasty, but I thought the pound cake and vanilla pudding tasted slightly artificial in flavor. Last, but not least, the tea was bagged instead of loose, and the servers only replenished the pot with hot water throughout the meal, instead of offering fresh tea, so the last pots of tea were considerably weaker than the first. However, allowances must be made when dealing with non-standard food preparation areas like behind the scenes at Dickens! Coventry Carolers at Cuthbert's Tea Shoppe. Photo: Virginia Urbach. Also new this year was a little bit of entertainment included with the tea. The Coventry Carolers were in the tea shop, providing live music as the guests were seated. After about 15 to 20 minutes, their performance ended, and the food began to be served. Halfway through tea time, there was a great deal of noise coming from one wall of the shop, where there was a decorative fireplace and mantel. This noise turned out to be a group of chimney-sweeps, who literally climbed down the “chimney” and through the fireplace, into the tea shop, accompanied by more noise and lots of dust. Authentically covered in soot and wielding chimney brushes, they spent a few minutes walking around the tea shop handing out “business cards” for their “sweeping service”, Miracle Sweeps of London (“If it’s a clean sweep, it’s a miracle!”), before gathering at the front of the shop to sing a funny song in fake Cockney accents that made the words almost unintelligible. 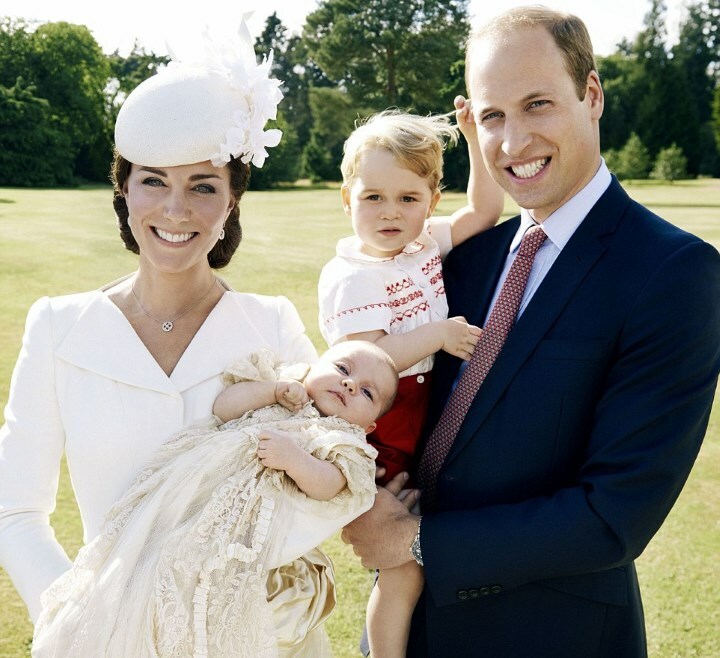 Unexpected guests at tea! Chimney sweeps at Cuthbert's Tea Shoppe. Photo: Virginia Urbach. Another change from last year was the small teapot included in the $21 price; instead of it being a 3-cup commemorative teapot with the Cuthbert’s Tea Shoppe logo on it, they were 3-cup teapots in a solid color, with no commemorative logo. My guest and I both received solid purple teapots. Perhaps, with the increased service of the prix-fixe afternoon and high teas, they ran out of the commemorative teapots? Or, perhaps they decided that a solid-color pot with no logo would be more fitting for year-round use in the customers’ homes. Cuthbert’s has a new location within the Dickens Fair layout, and has doubled its size with a second dining area called the Solarium. 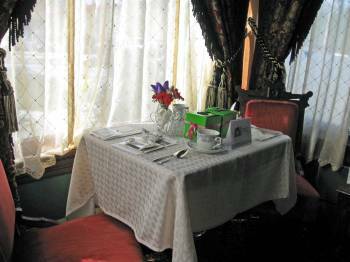 If you make your reservations for tea online, before you arrive at the Dickens Fair, you are automatically seated in the Solarium; if you make your reservations immediately upon arriving at the Dickens Fair (and they sell out all their seatings very quickly!) you are seated in the main dining area of the shop. There still seem to be some bugs to work out in their system, as indicated by the fact that we were seated almost 10 minutes later than our reservation, but the crowding was considerably less with the new expanded location, and the organization and staffing seemed to go much more smoothly than in past years. At any rate, the $21 price was still a reasonable one for the food and entertainment that the customers receive. It has the Ladies’ Tea Guild and the San Jose Tea Examiner’s “Seal of Approval”! Thomas and Carmel Fallon House, San Jose, CA. Wikimedia Commons. 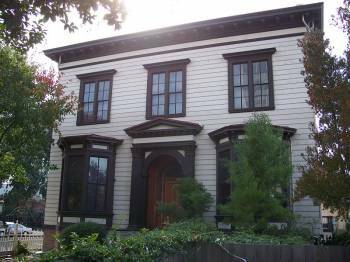 Enjoy a pot of hot tea and tour one of San Jose’s beautiful historic homes this weekend! History San Jose and Satori Tea Company have banded together to present a Heritage Holiday Champagne Tea and Tour at the Gold Rush-era Fallon House in San Pedro Square on Saturday, December 3rd. The basement of the historic Fallon House, which was once known as Manny’s Italian Cellar restaurant when the Victorian mansion was a boardinghouse called the Italia Hotel, has been repaired after being damaged by a minor flood a few years ago, and has been transformed into a tea room for the day. Satori Tea Company created a special black tea blend, called “Valley of Heart’s Delight,” flavored with apricots, cherries, and plums, especially for this event. The afternoon tea menu will also feature a selection of savories and sweets to pair with the tea. There will be two tea seatings, at 11 a.m. and 2 p.m., and tickets cost $45 per person ($40 for History San Jose members). Guided tours of the Fallon House and Peralta Adobe, as well as a variety of entertainments, are included in the ticket price. Accompanying the tea and tours will be sparkling wine from Guglielmo Winery, the Shady Shakespeare players, Christmas carols from the Lyric Theatre Victorian Carolers, and performances by the Liberty Baptist School band and choir, and the band Fiddle Road. Santa Claus will also attend – arriving on a vintage fire engine – and there will be wreath-making workshops, spinning demonstrations and other interesting historic activities. The Fallon House is located at 175 W. St. John Street, San Jose; there is limited free parking in the private lot behind the museum, but there are several public parking lots and a large parking garage within a block or two of the historic site. To make a reservation and buy your ticket, call Juanita Lara at (408) 918-1045 or e-mail jlara@historysanjose.org. 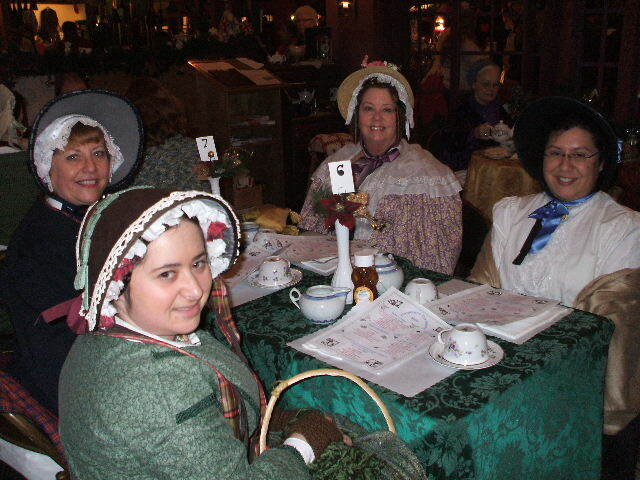 Victorian ladies at Cuthbert's Tea Shoppe, 2009. Photo: Valarie LaBore. The Christmas countdown in the Bay Area has officially begun, not because of Black Friday, but because of the opening of The Great Dickens Christmas Fair! 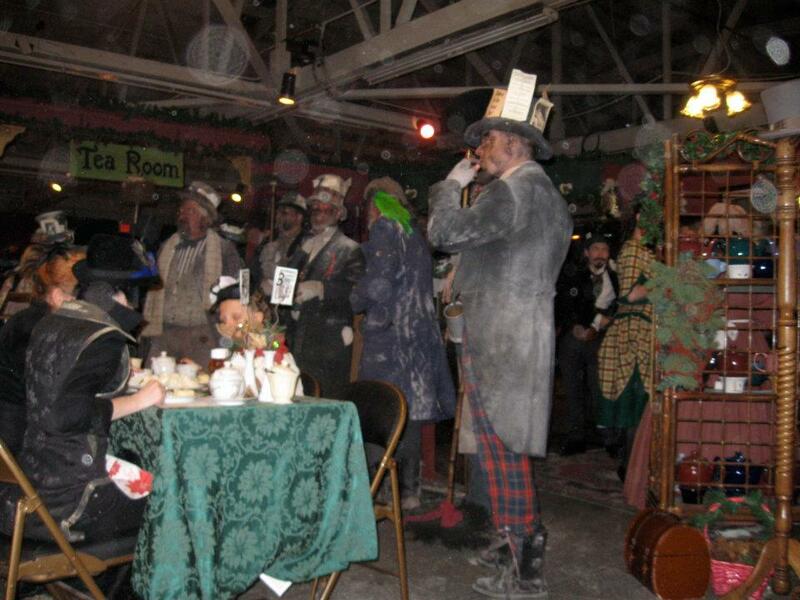 And of course, given the fact that tea became England’s national drink near the beginning of Charles Dickens’ lifetime, there are several places where you can get a nice cup of tea and a treat at the Dickens Fair. 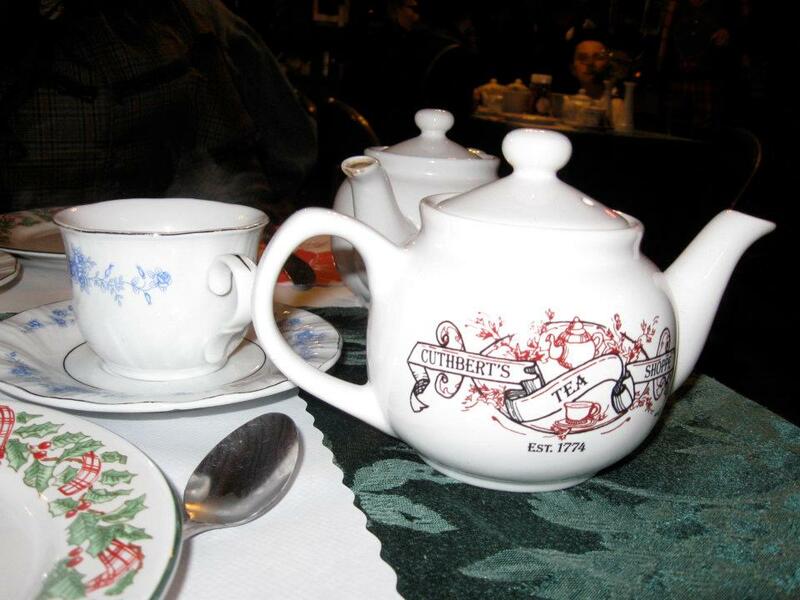 Cuthbert’s Tea Shoppe, the only sit-down tea room at Dickens, is the most popular place. Tea at Cuthbert’s Tea Shoppe is so popular that it is almost impossible to walk in and find an empty table. Advance reservations are highly recommended, and the traditional plan is to arrive at the Cow Palace at least an hour before opening time so that you can get in line near the front. That will enable you to walk through the Fair to the Tea Shoppe without having to waste too much time stuck in the crowd at the entrance. This year, opening time is 11 a.m. Once you’ve entered, immediately head for Cuthbert’s and get in line to make a reservation for later! This year, Cuthbert’s Tea Shoppe is also offering an online reservation service for customers, and they have expanded the Shoppe to include a Solarium dining area! Reserved seatings for afternoon tea in the Solarium are 11:45 a.m., 1 p.m., 2:15 p.m. and 4 p.m., and online reservations must be made at least 24 hours in advance. There is a $5 per person deposit required for online reservations, or you can pay for your afternoon tea in full, through PayPal. Once Cuthbert’s is booked, they don’t open the shop for walk-ins! Once you have your reservation, you are free to walk around and see the Fair, and come back when it’s your time for tea. You’ll need to check in and confirm your reservation around 15 minutes before your reserved tea time; if you’re running late, they’ll only hold your table for 10 minutes! Once you are seated at your table inside the shop, you can choose from a menu of a la carte items, or order the full afternoon tea, which costs $21 without tax; this is a prix fixe menu that includes one pot of tea, two scones or crumpets with butter, honey, whipped cream, lemon curd or jam (you can ask for more than one topping), one kind of tea sandwich (you get two sandwiches, both the same flavor) and one dessert item, plus a small commemorative teapot to take home. The a la carte menu enables you to order each item separately. 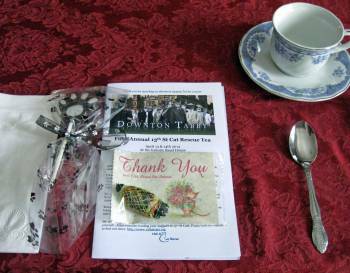 The High Tea is served at 4 p.m. and also includes a fixed menu and a teapot to take home. If you can’t get a reservation, you can buy all the a la carte menu items from the take-out window at the back of the tea shop, and there are a few small tables and chairs outside the shop windows where you can sit to eat your treats. There is also a tea booth – Mr. Brown’s Fine Coffee and Tea — elsewhere in the Fair, but seating nearby is on the regular picnic tables scattered throughout the venue. To get to the Dickens Fair from San Jose, take 101N, towards San Francisco, and take Exit 426 A/Brisbane. Merge on to Bayshore Highway, and take Bayshore to Daly City. Make a left off of Bayshore and onto Geneva Ave. once you get to Daly City, and follow the signs to 2600 Geneva Ave. You can also get to the Cow Palace on BART, and take the free shuttle from the Glen Park station. Admission is $25 per person – although there is a $3 discount if you purchase your tickets in advance online – and parking is $10 per car. The Dickens Fair runs on weekends from the Friday after Thanksgiving, to the Sunday before Christmas. 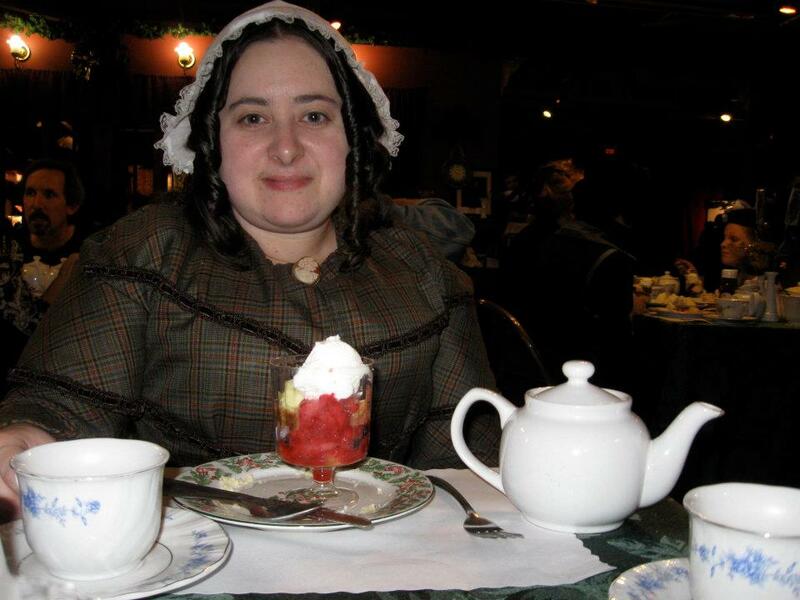 Having tea at Cuthbert’s – especially if you are dressed in Victorian costume – is an experience not to be missed!